Nalboor Tiles Marble What is the Difference Between Crema River and Crema Marfil Marble Tile? What is the Difference Between Crema River and Crema Marfil Marble Tile? When you’re shopping for marble as a building contractor, you’re looking for the most neutral shades available. Anything that’s too bold might detract buyers and if you’re building to sell, the best approach is to attract as many buyers as possible. It’s not always wise to build for a specific buying demographic. In the real estate business, even if a buyer decides to place an offer on a piece of property, there are still several steps that need to be taken in order for a sale to finalize. A realtor can attest that even though a certain buyer may seem to have everything ready to go, not all sales go through for one reason or another—whether the seller, realtor, buyer, or third-party is responsible—it doesn’t matter. The point is you want to appeal to all buyers, not to who you think might buy it. That doesn’t always work. The best way to go about doing this is by selecting neutral colors for interior designs. Soft whites, tans, and browns are typically the way to go when installing marble flooring and kitchen and bathroom countertops. This serves as a blank canvas, giving potential buyers an easier way of envisioning themselves living in the space. So assuming that you’ve found the perfect marble wholesale distributor, and you’ve narrowed down your options to stocking your warehouse with neutral color tones, you might fall into making that hard decision that most buyers tend to sway back and forth on: choosing between Crema River and Crema Marfil Marble. While they’re similar in name, their color shadings vary, giving each of them a distinctive look that warrants it’s on category. Crema River is a marble tile with beige, brown, and cream-color variations that typically come in a polished straight-edged finish. It’s the brown veining that gives this natural stone a warmer look. It also gives the appearance of more depth and dimension. If you look closely, you’ll even find tiny veining colored in red or yellow that only contributes to its rich looking surface. You’ll find that the surface of this tile is going to be a bit busier because of the multiple color variations and the amount of veining. However, because they’re not so noticeable to the eye, the overall look gives off a deeper color tone while still keeping the space looking fresh and bright. Crema Marfil is the other option. Also having a polished straight-edged finish, the surface of this color tone is mixed with beige, cream, and ivory instead of beige, cream, and brown. As you can imagine, this makes a big difference in the overall look of the tile. This particular brand of Crema Marfil is mined in Turkey and can now be available to you in bulk at a discount price. 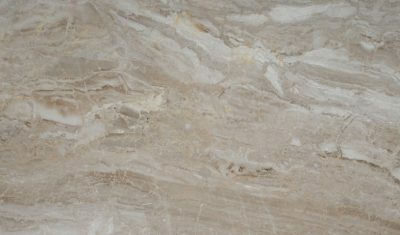 While Crema Marfil also has some minor red and yellow veining, it appears to be more visible because of the ivory coloring that dominates the overall surface. Because of this, it is considered a select quality of marble tiles. In the world of marble, less veining is considered a higher grade because while veining creates character, to marble experts, it also represents cracks and fissures within the slab. Those cracks and fissures you see in slabs of marble are the organic matter that’s kind of stuck in between the metamorphic limestone. These fissures are considered the weaker part of the slab where it could break more easily. But because this is now a new material made up of different minerals, it’s now stronger than before. So while some people might prefer marble tile with more cracks and fissures, others might want a higher grade that has less. In all, it’s still a durable building material that has been known to last throughout the ages. Let’s not forget that its still marble—and it’s all good! While one is considered a higher grade, the Crema Marfil and Crema River actually start out at the same cost if you choose to stock your supply from Nalboor Tiles. Nalboor Tiles is a natural stone online wholesale distributor based in Miami where we are strategically positioned to accept incoming shipments of marble tile on an ongoing basis. This in turn, keeps our warehouses stocked at all times ready to ship out bulk crates of luxurious marble tiles to you at a moment’s notice. Nalboor Tiles offers this preferred quality of tile in three different sizes. The Crema River is offered in one. Both types offer the 24” x 24” that is considered the European standard, but aside from the starting cost of $3.95 per square ft., this is where the similarities end. Builders have the option of selecting Crema Marfil in a couple more sizes: 12” x 12” and 18” x 18”. Naloor Tiles only sells to builders, contractors, developers, architects, and designers—anyone who needs to buy in bulk, but also has the storage for it. End users are more than welcomed to call our customer service representatives to get a referral of the nearest marble tile distributor as we have a large database of clients who stock their marble inventory from us. Because we sell in bulk, we offer generous discounts, but you have to order at least one full crate to qualify. Orders over 5,000 need to be called in so that we can provide an accurate quote and arrange a special container for shipment. Place your order today or call for a free sample. If you have more questions, use our online contact form or call 1-305-501-4548.